The 24th Special Tactics Squadron is one of the Special Tactics units of the United States Air Force Special Operations Command (AFSOC). It is the U.S. Air Force component to Joint Special Operations Command. It is garrisoned at Pope Field, North Carolina. The first predecessor of the squadron was activated at Hamilton Field in October 1941 to be the director unit for the 24th Pursuit Group, which was formed simultaneously at Clark Field, Philippines as the headquarters for pursuit squadrons of the Philippine Department Air Force. After completing training, the squadron sailed on the USAT President Garfield on 6 December 1941. However, due to the Japanese attacks on Pearl Harbor and Clark Field, the President Garfield returned to port on 10 December and the squadron returned to Hamilton Field. Although nominally assigned to the 24th Group from January though October of 1942, the squadron served with air defense forces on the Pacific coast until it was disbanded on 31 March 1944 when the Army Air Forces converted its units in the US from rigid table of organization units to more flexible base units. Its personnel and equipment were transferred to the 411th AAF Base Unit (Fighter Wing) at Berkeley, California. The 24th Special Tactics Squadron participated in the United States invasion of Panama in 1989. The 24th STS deployed 11 personnel including the unit commander, Lt. Col. Jim Oeser, as part of JSOC's Task Force Ranger during Operation Restore Hope in 1993. Due to their actions during the Battle of Mogadishu multiple decorations were awarded to the airmen. Pararescueman (PJ) TSgt Tim Wilkinson received the Air Force Cross and fellow PJ MSgt Scott Fales received the Silver Star, both for providing lifesaving medical care to wounded soldiers. Combat Controller (CCT) SSgt. Jeffrey W. Bray also received the Silver Star for coordinating helicopter attack runs throughout the night around their positions. The 24th STS was a part of JSOC's Task Force 145 which was a provisional grouping specifically charged with hunting down high-value al-Qaeda and Iraqi leadership including Al-Qaeda in Iraq leader, Abu Musab al-Zarqawi, who was killed in June 2006. Colon-Lopez in Afghanistan in 2004 while a member of the 24th STS. PJ Tim Wilkinson received the Air Force Cross for his actions during the 1993 Battle of Mogadishu. Wilkinson was portrayed by Ty Burrell in the 2001 film Black Hawk Down which chronicled the events of the Battle of Mogadishu. CCT John Chapman was posthumously awarded the Air Force Cross, and is the first Air Force member to receive the Medal of Honor since the Vietnam Era, for his actions in the Battle of Takur Ghar during the War in Afghanistan. In 2005 a U.S. Navy Buffalo Soldier-class container ship was renamed the TSgt John A. Chapman in Chapman's honor. PJ Ramon Colon-Lopez was a member of the 24th STS twice. From February 1999 – January 2005 Colon-Lopez was a Special Tactics Element Leader and April 2009 – April 2011 he was the Squadron's Senior Enlisted Advisor. In 2007 Colon-Lopez was one of the first six recipients of the newly created Air Force Combat Action Medal. He was awarded the AFCAM for a 2004 operation in Afghanistan during which he led an Advance Force Operations Team. ^ a b c d e f g h i j k l m n o p Robertson, Patsy (9 June 2010). "Factsheet 24 Special Tactics Squadron (AFSOC)". Air Force Historical Research Agency. Retrieved 29 March 2018. ^ Priest, Dana (2 September 2011). "'Top Secret America': A look at the military's Joint Special Operations Command – Washington Post". Washington Post. Retrieved 4 May 2013. ^ "The Secret US War in Pakistan". The Nation. 23 November 2009. Retrieved 13 May 2013. ^ "In high demand, Air Force commandos must find new ways to cope with stress of duty". The Gaffney Ledger. 9 May 2005. Archived from the original on 28 September 2013. Retrieved 27 September 2017. ^ Haulman, Daniel L. (12 November 2015). "The United States Air Force in Somalia, 1992-1995" (PDF). pp. 11, 13. ^ a b Oliveri, Frank (June 1992). "Heroes at Mogadishu". Air Force Magazine. Retrieved 10 March 2013. ^ "Awards of the Silver Star for Conspicuous Gallantry in Action During Operation Restore Hope in Somalia(1993)". Retrieved 10 March 2013. ^ Gertz, Bill (3 October 1993). "The Fast Pace of Special Ops". Airforcemag.com. Retrieved 13 May 2013. ^ Groen, Ken (2001). "413 Squadron wins Diamond Trophy at SAREX" (PDF). SARSCENE. p. 8. ISSN 1183-5036. Retrieved 2 May 2013. ^ John Pike. "23rd Special Tactics Squadron [23rd STS]". Globalsecurity.org. Retrieved 2 May 2013. ^ Naylor, Sean (2006). Not a Good Day to Die: The Untold Story of Operation Anaconda. Berkeley: Berkley Books. ISBN 0-425-19609-7. ^ John Pike. "United States Combat Jumps". Globalsecurity.org. Retrieved 13 May 2013. ^ "Air Force Staff Sgt. Scott D. Sather". Projects.militarytimes.com. 8 April 2003. Retrieved 13 May 2013. ^ Michael Robert Patterson. "Scott D. Sather, Staff Sergeant, United States Air Force". Arlingtoncemetery.net. Retrieved 13 May 2013. ^ "Our Fallen Heroes: Scott Sather". SOFREP. Retrieved 13 May 2013. ^ "DVIDS – News – Sather Air Base welcomes new commander". Dvidshub.net. Retrieved 13 May 2013. ^ "OTS Foundation Portal – The hunt ends". Air Force OTS. 11 September 2001. Archived from the original on 28 June 2013. Retrieved 13 May 2013. ^ "Pentagon releases names of 30 Americans killed in Afghanistan helicopter crash". New York Post. 11 August 2011. Retrieved 27 September 2017. ^ "Airmen to walk 800 miles in memorial march for fallen from Bragg" (PDF). Fayobserver.com. 15 October 2011. Retrieved 13 May 2013. ^ "The Air Force Cross For Actions in Somalia in 1993". Retrieved 7 September 2012. ^ "Ty Burrell, left,... – Ty Burrell and Jeremy Piven in 'Black Hawk Down'". Courant.com. Retrieved 13 May 2013. ^ "The Air Force Cross in the Global War on Terrorism". Retrieved 7 September 2012. ^ LaRaia, Becky J.; McKeown, Lisa Terry (8 April 2005). "Ship takes heroic legacy to the fight". 43rd Airlift Wing Public Affairs. Retrieved 15 January 2010. ^ "USAF Biography: Chief Master Sergeant Ramon Colon-Lopez". Kadena Air Base. January 2013. Archived from the original on 18 February 2013. Retrieved 1 May 2013. ^ Burgess, Lisa (13 June 2007). "Officials honor first recipients of Air Force Combat Action Medal". Stars and Stripes. Retrieved 27 September 2017. ^ Randolph, Monique (12 June 2007). "Air Force Awards First Combat Action Medals". American Forces Press Services. Archived from the original on 14 July 2013. Retrieved 14 July 2013. ^ Martin, Mike (16 October 2012). "AFSOC Airmen past, present recognized at 2012 Air Commando Association banquet". Air Force Special Operations Command Public Affairs. Retrieved 14 July 2014. ^ "Colonel Marc F. Stratton". United States Air Force. July 2011. Archived from the original on 24 February 2013. Retrieved 11 May 2015. ^ "Colonel Robert G. Armfield". Air Force Special Operations Command. May 2013. Retrieved 27 September 2013. ^ "Colonel Matthew Wolfe Davidson". 24th Special Operations Wing. September 2014. Archived from the original on 27 September 2017. Retrieved 27 September 2017. Col John T. Carney Jr.; Benjamin F. Schemmer (2003). 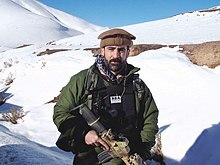 No Room for Error: The Covert Operations of America's Special Tactics Units from Iran To Afghanistan. Presidio Press. ISBN 978-0345453358. Wikimedia Commons has media related to 24th Special Tactics Squadron. "24th Special Operations Wing". Air Force Special Operations Command. 20 February 2015. Retrieved 4 May 2013.